If you’re truly looking to escape the city life hustle for a bit, or have yourself a romantic getaway with the S.O, this remote resort, tucked deep into the forests of the Nilgiris away from all the noise is the place for you. Cosily nestled right in between the Wayanad hills and the Mudhumalai Tiger Reserve, the Wild Planet Resort is the perfect getaway from the blaring horns and the claustrophobia of city life. With lush green and plenty of wildlife around, this resort is located right in the middle of a dense rain forest which should make for quite the adventure. Whether you’re looking for a good time with the fam jam or just a secluded spot to cosy up with a special someone, this resort has just the right vacay vibe you’re looking for. Claiming to be the remotest resort in all of South Asia, this resort guarantees peaceful seclusion and plenty of adventure. Getting to this place is quite the experience in itself as you’ll literally have to take the road less travelled by and drive over a long muddy stretch to get to this deep-seated property. Get the best of both worlds at this place, with the thrill and adventure of the great outdoors and all the luxuries and amenities for you to have a comfortable stay here. With an outdoor pool that’s functional all year round and a restaurant that serves a complimentary breakfast, this place is equipped with all the facilities you would want on your vacay. They also have quite a few accommodations to choose from. You can stay at their Valley View Cabins, situated on the slopes of the hillocks, with easy access to the lake and the pool. 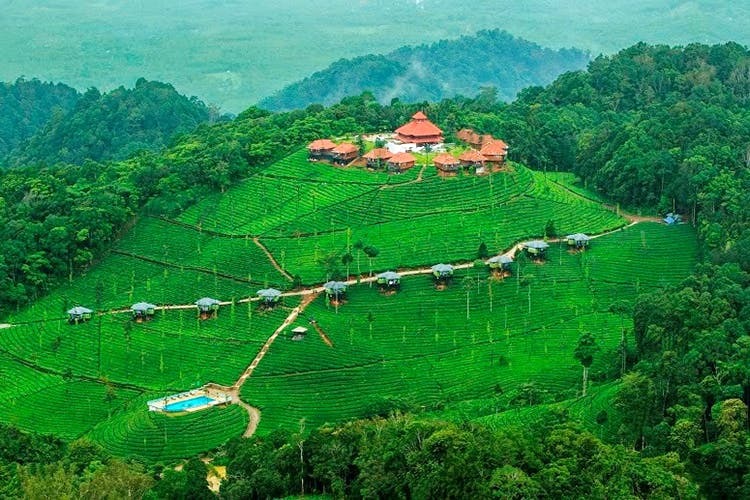 Their Hill Top Cottages give you a bit more space and are right on top of the hill giving you a breathtaking view of the tea plantations and the mountain ranges of the Nilgiris. Or you could settle in their Jungle Log House which is a cosy cabin perfect for two, right in the middle of 10 acres of private forest land. This one is for those couples who want their vacations with a side of adventure and wish to experience the forest up-close. The log houses are further away from the rest of the resort, making it a super snug and private space. And if you’re lucky, you should be able to spot some elephants while you’re there. Opened in 2016, this place has been providing solace for almost a year now, at rates starting at INR 9,000. Can’t get enough of nature. Surrounded by lush green and rich biodiversity on all sides, Wild Planet Resort is a nature lover’s paradise. This ecolodge has a 100 acres of land operating perfectly in sync with the nature around it, establishing an interdependent relationship with the Nilgiris communities, the wildlife and tourism. Breathe in the freshest air and walk on the greenest grass while you’re here. We recommend heading down there right now as the summers are quite pleasant in the Nilgiris, with easy temperatures ranging from 20°C to 35°C that extend well into the month of June.